For lovers of Vintage Vegas, Elvis Presley must necessarily loom large. In keeping with my fascination for old time Vegas, I spent a few hours at a party marking the 40th anniversary of Elvis Presley’s return to Sin City. The event was hosted by the Viva Las Vegas Club, a local fan club devoted to commemorating “the memory & legacy of Elvis in Las Vegas.” While there, I had the opportunity to speak to a few locals who love Elvis. Some knew him personally, most had attended concerts, and at least one hadn’t even been born when Elvis came to Vegas in 1969. The party included bingo with Elvis-related kitsch for prizes, a silent auction of Elvis memorabilia with impressive pedigrees, karaoke singing by some damn good Elvis impersonators, and trivia I had no hope of answering. But most of all, it was a chance for people to talk about their fond memories or recent discovery of an entertainer who lives on in spirit, if not in body. The first people I spoke with were newcomers to the club, Scott and Felicia. While Felicia explored the party environs, Scott explained to me how his wife, younger than the anniversary being celebrated, had become a Elvis devotee. In 2006, by pure chance, Scott had picked up athe DVD of Elvis’ 1971 Comeback Concert. Felicia watched it, and a fan was born. In the ensuing few years, they’ve bought most of the movies, gathered together a small shrine of memorabilia, and even made the trek to Graceland. So far, Scott has balked at Felicia’s desired purchase of a replica of a costume (costing anywhere from $1500-$3000). But if I were a gambler, I’d put my money on Felicia getting her way. You see, I am not entirely convinced she’s the only fan in that family. In contrast to Felicia’s newfound fandom, Lorrie Mallicone has been a fan since she was in the womb. It seems that only Elvis’s velvet voice could sooth her mother’s morning sickness. Lorrie never met Elvis, but she attended more than a dozen concerts and spent some time outside the King’s house, eager for a glimpse. Sandi Miller is one of those who got the chance to meet the King. 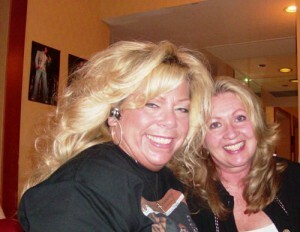 Like Lorrie, she joined the crowds of fans who would wait outside the gates of Elvis’s homes. Her devotion paid off, as she was lucky enough to be invited inside–more than once. And like others I spoke with, she maintains friendships with fellow fans met at concerts to this day. never exactly met the King, but she did say “hi” in passing to him a few times. Her father was an employee of the International, and so Sue would sometimes see Elvis in the employee hallways–in other words, just before Elvis had left the building. She too attended many concerts. Aside from the excitement of the show, she enjoyed the people she met at those concerts. Waiting in line to see the Elvis perform, she had the opportunity to chat with people from all over the world. Not surprisingly, she found that more exciting than hanging out with the other kids at school. While this was a happy occasion, the Viva Las Vegas Club’s next event will be to mark the anniversary of Elvis Presley’s death, August 16, 1977, with a memorial service on Saturday, August 15, at 8 pm. The event will occur by the bronze statute of Elvis located in front of the Hilton. They invite all Elvis fans to participate. In addition to honoring the memory of the King, the Viva Las Vegas Club also engages in charitable activities. The club’s donations to charity are made in the name of Elvis Presley. The silent auction was for the benefit of St. Jude’s Ranch for Children, a residential facility for abandoned and neglected children located in Boulder City. 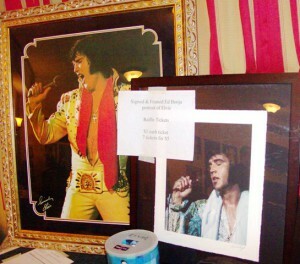 I put my bid on a finely framed photo of Elvis, but alas, I was outbid. As I spoke with the attendees of the party that night, I was asked over and over again “Are you a fan?” I stumbled over my reply every time. While I had always liked him fine, I can’t claim to have been a particular fan. In fact, I had pretty much always thought of Elvis as really just a piece of Vintage Vegas, a part of what made Vegas into Vegas, perhaps even personified it. I had never given much thought of him as a real person who lived, breathed, sang, and was very gracious with his fans. I certainly never thought about how he enriched the lives of his devotees. But settled on the edge of a bed in a suite at the Hilton, drinking a bottle of Elvis’s favorite bottled water, listening to men dressed in tight clothes croon his songs, and hearing tales of the intersection of his life with those of his admirers, I understood that the gentle and generous devotion of his fans reflects the quality of the star. Were there any Elvis impersonators in attendance? Or is that not part of the ritual of this fan club? It really is amazing that Presley’s fame is so alive and robust, thirty-two years after his passing. Thanks for the field report! There were two professional impersonators present, both of whom rang very true in voice to my ear. To me, the most amazing thing is how Elvis continues to gather fans, even among those who were born after his death. But I suppose that is true for all great artists. to answer your question mark, no, impersonators are not really a part of this club. the gentlemen who sang that night have worked professionally as elvis tribute artists, but that evening, they came as club members, as fans,( not in jumpsuits,) and sang because they love the music and elvis. we appreciate impersonators, but we are not dependent on them to keep elvis’ memory alive. we are imaginative in paying tribute to elvis without eta’s as a focus. 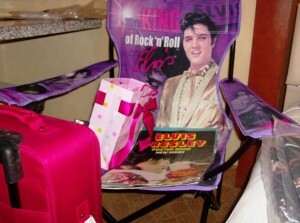 to learn more about how we promote elvis and his connection to las vegas, check out our website. the club was very happy with how the party went and we were glad to share our ‘happening’ with ms cowden. we really appreciate this article! the ‘tigerman returns’ event is a tradition with us and we will continue to do this annually. it’s our way to maintain the significance of july 31, 1969.
elvis: the once and forever king of vegas!